A "must have" to go with your cuddly soft Minky blanket. When you lay your head on this Minky pillowcase, you'll wonder how you ever slept a night without one. This pillowcase comes in a standard size, and is available in any of our quality Minky fabrics. Choose your body and trim from any of our fabrics. 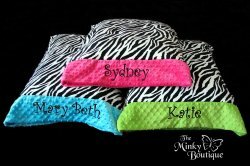 Each pillowcase comes personalized with one name across the trim at no additional cost.